This is Jessie's answer to a question from Erin last week about people first language. Language is what we speak, and we can choose what words we say and we can choose our words wisely. It’s wise NOT to use the “R” word, we probably all know that. And call out other people when they do. That’s hard but important. Once at my church I had talked about ending the use the the “R” word. In general ,most people in the world say this word in casual conversations, and they don’t realize that it’s hurtful and offensive to other people. Especially all people of all abilities. We need to focus on the word Ability. And Respect. We need to be careful of what we say and how we say it. It’s just as important to use people first language. That means that the PERSON comes first. Sometimes people think that if it isn’t rude, then it’s okay. But I would never say I am Downs. I’m not, I’m Jessie! 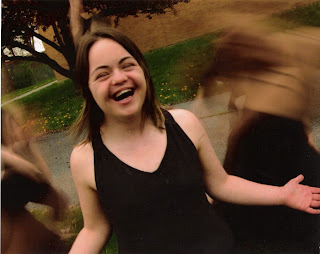 Down syndrome is a part of me, but it is not all of me. Here’s a poem about how I feel about having Down syndrome. This was long time ago when I was younger. (It was turned into a dance for the DandelionDance Company, we recorded me saying it and my cousin wrote the music for it) and we performed it all across the country! You can share it. I’d love you to share it! But please say that it was by me. That I wrote it. So you can share it but say © Jessie Huggett, 2004 and say where you found it (at my mom’s blog, until I start my own). And if you do share it, could you tell me about it? I feel that they don't see the real me. They only see some kid with Down syndrome. It's not all of me. I love to fool around with my friends. Be happy for who you are in your heart. 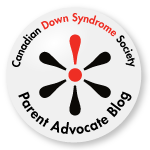 People with Down syndrome should be allowed in schools. They should be treated equally--equally in their hearts. They should be involved in sports, like basketball, football. They should dance and sing! Sometimes I do not fit in. They see a girl who has Down syndrome. They do not see who I really am. be gentle, do no fight. And fight for your rights! I have friends and people who love me. and people who love me. I give my beautiful thoughts. I give my lovely dreams. Wow Jessie this is really good! You're a great writer! Thank you for answering my question so beautifully. I was moved both by your response and your poem. I plan to share this post far and wide! What a beautiful, and wise, poem! Thanks Patricia ... oh my goodness your "little house on the pond" is an inspiration!!!!!!!! !